Events are great ways to get to know our community and our members! re you’ll learn the basic techniques and fundamentals of grain-free and guilt-free baking. If you’ve ever seen Sweet Laurel’s decadent treats at Erewhon, Eataly, or new Cake Shop in the Palisades Village, now’s your chance to learn how she makes all those grain-free, paleo treats so unbelievably delicious! Normally, Laurel’s classes are up to $100, so this is a treat you won’t want to miss! The class will be held in the Swarthmore Room at the beautiful new Palisades Village. This event is open to JLLA and non-JLLA members, and all proceeds will benefit the projects and programs of the Junior League. There is a garage on site at the Palisades Village. For self-parking, the first hour is complimentary, the next half-hour is $4, and every half-hour thereafter is $2. Price per Ticket is $65. Buy yours here! 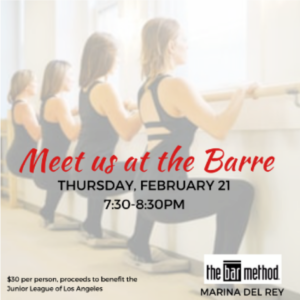 Join the Junior League of Los Angeles for a private Bar Method class on Thursday, February 21, 2019 at 7:30pm in Marina Del Rey. Whether you’re a Bar Method veteran, a former dance champion, or just looking to enjoy a fun exercise class with friends, we look forward to seeing you! This event is open to JLLA and non-JLLA members, and all proceeds will benefit the projects and programs of the Junior League of Los Angeles. All attendees will receive a discount code towards future classes. (Learn more about the Bar Method here:https://barmethod.com/the-workout/). There is garage parking available on site. Price per Ticket is $30. Buy yours here!